Nurses must come together to prevent a real-terms pay cut. 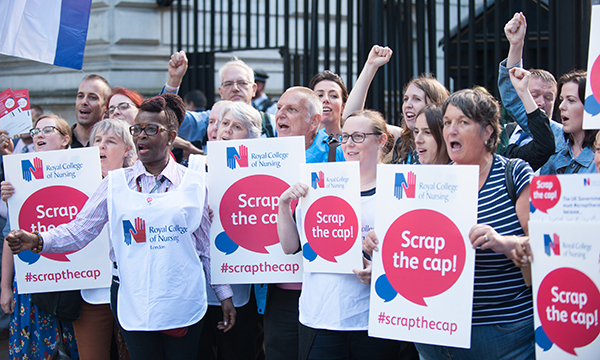 Nursing Management subscribers will be receiving print copies of the September issue just days before the RCN’s latest move in its pay Scrap the Cap pay campaign, its ‘biggest ever UK rally’, in London on Wednesday 6 September. According to general secretary Janet Davies, the ‘summer of protest’ message is getting through. To illustrate the effect of this pay cut she offers figures from the Nursing and Midwifery Council showing that, for the first time, more nurses are leaving the register than joining it; figures that no one can ignore, she suggests. Ministers point to their plans to fund an extra 10,000 training places for nurses, midwives and allied health professionals by 2020, but this figure seems less impressive when set against the abolition of the nursing bursary from this autumn, for example. You may have already read online Nursing Management’s analysis by Nick Evans about staff retention remaining a major problem for the NHS. Or maybe you’ve seen Kat Keogh’s report on the latest RCN warning that nine out of ten of England’s 50 largest NHS hospital trusts are not staffed with nurses to the level planned by their own management. Unless these issues are addressed, patient care and safety are going to suffer. And while the government seems to have its hands full with Brexit and, more immediately, how to respond in the event of war between North Korea and the US, the future of the NHS must be the most pressing domestic issue facing ministers today. They must act. Surely, it’s time to scrap the cap. Register your interest in the Parliament Square rally on 6 September here.